We haven't talked about chocolate in a long time. This would be the time when your friends notice something's amiss, and start asking if everything is alright. So before anyone gets too concerned about the recent lack of chocolate on My Munchable, let's turn to the Australian cacao producers. Now, before we get too far, it's worth mentioning that yesterday was World Fair Trade Day, which in principle is great - striving for fair wages and labour conditions, as well environmentally responsible practices. If you've been reading this blog for a while, you will know I'm a bit skeptical and have found little convincing evidence about the efficacy of Fair Trade in achieving its stated goals. Chocolate has been one of the biggest targets of Fair Trade efforts, largely because of the outrage over child labour practices in Cote D'Ivoire and other West African countries, and the resulting campaigns against major brands like Hershey's. But I want to take a slightly different look at the fairness of trade in the global cocoa sector, and particularly transboundary issues. Why? Well, as you know I recently moved to Australia. While a vast country spanning a large number of ecological and climatic zones, the far northern reaches are suitable for growing certain tropical commodity crops - tea, sugar cane, coffee, and - yes you guessed it - cacao. A residue of a colonial past, it's pretty well established that the consumption of these crops is usually some place other than where they're grown. Ghana may be the second largest producer, but the amount per capita consumed (~0.5kg per year) falls even below India! While still only half of what the Swiss manage, Australians eat around 6kg per person per year! And although it's pretty atypical for one of these top consumers to also grow the crop, Australia produces such an insignificant amount that I can't even find a statistic from the Department of Agriculture or the FAO statistics (compared to Ghana with over 800,000 tonnes in 2013)! But people are talking, and to some extent doing. With nearly 3/4 of the world's cocoa production taking place in West Africa - a region expected to become increasingly less viable for the crop due to climate change - there has been a growing fear that the world may run into a cocoa shortage. 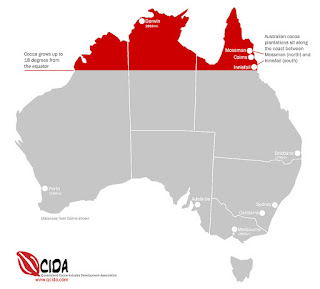 Cadbury announced big plans for investing in cultivation trials in Australia back in 2013. Then there are a number of small farms popping up in Northern Queensland, trying to get in early on the action. Daintree Estates has been in operation for five years now; the North Queensland Chocolate Company creates raw bars; and Charley's Chocolate Factory has a few Austrlian origin bars in addition to their Pacific varieties. A big barrier to growing cocoa in the country is costs, because of the relatively higher cost of land and more stringent minimum wage and labour condition standards. The latter (and frankly, the size of the industry) make a Fair Trade label essentially unnecessary. So the 'local' food enthusiast in me was rejoicing, when an article from about a decade ago highlighted how ethical consumption is a bit more complicated. 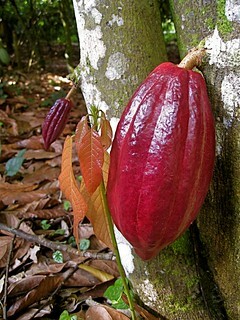 It argued (though not very extensively) that growing cocoa in Australia is not fair to the millions of farmers in neighbouring developing countries whose livelihoods depend on the commodity. So this is a can of worms I'm not interested in opening at the moment, because I think it brings the discussion of 'fair trade' beyond individual instances of justice to tackling issues of historical legacy (ie colonialism...) and the responsibilities of global citizenship. While I don't believe there is much danger of Australia stealing away business from smallholders in developing countries, this does raise ethical questions around unintended (but probably anticipated) consequences of such development. Because we now live in a very globalized food economy, demand from halfway around the world has resounding consequences for suppliers. Coffee is a good example of how changing global demand can lead to boom and bust cycles, where fluctuations may complete undermine the livelihoods of smallscale farmers and most assuredly hinder long-term agricultural planning. Finally, it is aruably environmentally irresponsible to grow another commodity crop in the highly biodiverse, and continually threatened, northwestern region of Australia. But all of these for another day.